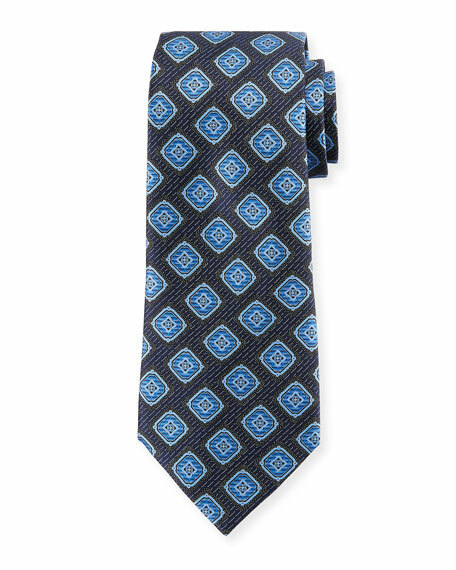 Ermenegildo Zegna tie featuring abstract floral motif. Approx. 57"L; 3.5" at widest. Silk; dry clean. Made in Italy. Ermenegildo Zegna tie in diagonal chain pattern. Silk; dry clean. Made in Italy. Ermenegildo Zegna tie featuring geometric-patterned diagonal stripes. Approx. 58"L; 3.5" at widest. Silk; dry clean. Made in Italy.